Is there a print version of this book? Our webtexts are meant to be used online so as to take advantage of the best interactive features of the web. Many of our webtexts can be ordered on demand in a printed version, but they do not contain any of the questions to answer, videos to watch, or links to follow. Students will need access to the online webtext to complete any work assigned for credit. If this option is available, you will see it in the Tools Menu. 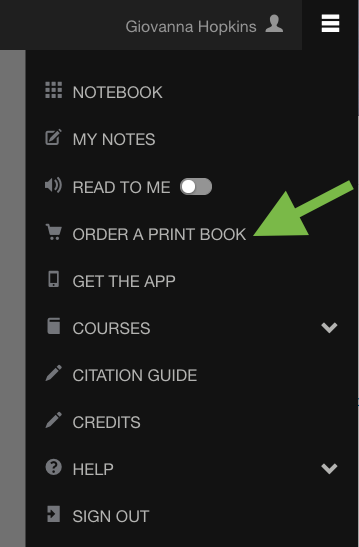 Click the button in the upper right and then click “Order a Print Book” (you will not see this option if you are in a free trial). This takes six to ten business days to print and ship. Because we are not a school bookstore, we are unable to accept vouchers and other forms of financial aid as payment. Any regular debit or credit card will work. Printing the webtext at home yourself is an option, but it would likely take a while. You would have to print one webpage at a time (by clicking File > Print) as it isn’t possible to print a whole chapter at once. There is no downloadable or PDF version of the webtext.